There are beauty benefits to wine! I found that out a few weekends ago when I had a free massage and sampled the new Molton Brown Rosa Absolute range. Yes, have you ever wondered how to pamper yourself for free? Try before you buy? Quaff free fizz? Or, learn pro tips on maximising fragrance? And potentially leave a shop with a prize? Well, you’ve come to the right place. That’s what happened when I went along for a free hand and arm massage at Molton Brown. I have to say, as someone who is not a massive fan of rose fragrances, I was really really surprised to like Rosa Absolute so much. Which is just as well, as I won a £20 bottle of the bath and shower gel, so I can slather it on as I please! But, overall, I was just really impressed with how fantastic the whole experience was. It was thanks to La Redoute and the #LRSummerParty that I had my voucher for a hand massage for myself and a friend. You can read more about that here: La Redoute Summer Party. I met up with Sasha of The Life Notes, who I hadn’t seen (In Real Life) for 10 years! I mentioned Sasha as one of my blogging inspirations in my post on my motivation to start writing, so it was so exciting to see her and I wanted us to have a few treats over our staycation weekend (for those who are wondering, a staycation is where you ‘holiday’ without going abroad). And this was such a treat! Little did I know that I could have booked this myself ages ago, as it’s open for all (details below)! I’ll be honest, I was sold at the offer of a prosecco on arrival. Baby free and let loose, I was all over it! We had a really warm welcome and have massive thanks and love for the lady doing our massages (I didn’t catch her name in the excitement!). She was super knowledgeable and just all round lovely. She expertly told the story of Rosa Absolute as we meandered through the fact that she’d love to add midwifery to her talents – from someone who has had the benefit of some amazing midwives, I think she’d be great at it! Oh, it felt so good pretending to be one of those ladies who does this all the time. Imagining that I had all manner of glamorous things in my bag – instead of the dummies and baby wipes I had to get past to find my purse. Hah! Secrecy, decadence and passion – oh, my! Rosa Absolute is made of Italian rose oil, blackcurrant and patchouli. The story, (which you can see more of here ) is of secrecy, decadence and passion. The design, scent and the experience we had really brought this to life! Plus, now I am trying to be more mindful of the products I use, I also was happy to learn that Molton Brown products are cruelty free, like the REN skincare lotion I recently reviewed. Let’s talk about hand creams: Although, I have them, I’ve never prioritised using them as I always thought they were for older people – ahh, the arrogance of youth! But, I am now ‘older people’ and, as I mentioned on Facebook and Instagram, my hands currently look prehistoric. Horrif! I am reliably informed that dry hands are a common trait of new mums, so I’m not alone. But, I needed to do something. Pronto. I was about to get started on a Cowshed hand cream I got in a Birchbox, but now that I have some new kit, I’ll give this a go first. One arm was massaged with scrub, followed by the cream and the other was without scrub, but with the richer white truffle lotion. Very swish! Sasha tried out the Rhubarb and Rose and the Pink Pepperpod, which I’m sure she’ll talk more about over at The Life Notes. The scrub was the Ambrusca scrub, which is actually a body scrub. It contains Moroccan Argan oil to tone the skin, antioxidant-rich Ambrusca grape leaf extract and Ground olive stones to exfoliate. So, whilst it doesn’t contain actual wine, Ambrusca is a grape leaf, grapes make wine…! If there’s any doubt: Cleopatra bathed in vats of wine and we now know there a many boozy beauty benefits. So, although we’re told not to do it, mixing beauty and wine was working out for me! I found the combination of scrub and cream was amazing and I was thrilled with it. But, just the Alba White Truffle cream alone gave an even better result. The cream was £14, which is much less than I expected, for how good it felt, so I decided to go for it. My (very) hopeful thoughts are that by using the cream, in combination with the scrub, I’ll be giving B a run for his money in the baby-soft skin category in no time! We were also taught how to layer fragrance to get the maximum effect. Ah-haaah, so those sets that have shower gel, cream and scent are for that very reason, not just to tempt us to part with more cash. Granted, layering it on isn’t exactly rocket science, it makes sense (scents)! But, it’s not just about the scent, the most important rule is that your skin needs to be well hydrated first and that way it doesn’t simply drink in all the fragrance. Then, when you follow with a spritz of an eau de toilette and or eau de parfum, your fragrance will hold for longer. The next part was so much fun: Continuing with the Rosa Absolute theme, I was offered the chance to unlock a prize from the chest of secrets and we all gathered round as I selected a key to try to open the chest. If your key unlocks the chest, you then choose an envelope and every envelope contains a prize – the top prize being a holiday to Lombardia, Italy! After much excitement, giggling and decision making (and with a little encouragement), I chose the right key and won a full sized bottle of Rosa Absolute Bath and Shower Gel worth £20! As someone who never wins anything, this was just the icing on the cake of a brilliant experience. I’ll be using it when I treat myself to a long bath (yes, these things are considered to be an absolute treat these days!). The good news is you can book yourself in for a complimentary massage anytime here: Massage booking. I think it’s a great idea for a free treat. With the glass of fizz and all the gorgeous smells on offer to try and to be tantalised by, I’m sure you’ll find something you like, even with no obligation to buy. Sasha got the Pink Pepperpod Replenishing Hand cream which was £10 that she was very pleased with. So, if you’re looking for Christmas gift inspiration or want to try before you buy, it’s ideal. Because our total order came to £40, we also got a free travel size set: Special Offers. So, all that, along with my prize means I am fully kitted out for a long time to come. It is also going to make me focus more on taking care of my prehistoric hands. But, best of all, I felt like I’d had a real treat. Thanks first to La Redoute for having Molton Brown at the #LRSummerParty and obviously Molton Brown for being great! 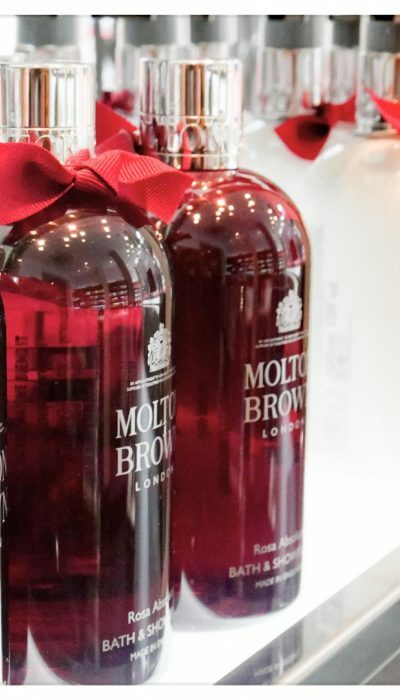 Have you treated yourself to a free hand and arm massage at Molton Brown? What are your favourite Molton Brown scents? Oh I would love this! That scent sounds divine. I think setting aside the time to be pampered is a must especially once you become a parent! This looks amazing. Congrats on your win. I am so jealous.